Listing Summary: The eastern frontage of the property is located on South White Mountain Road. The southern boundary is across from the entrance to the Vacation Village Arena, which is south of the Park Pineway shopping center. The northern most boundary is just north of the Park Pineway Road, with the western boundary fronting Cub Lake Road. 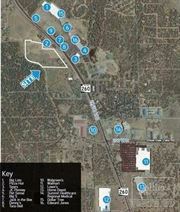 Commercially zoned land for sale, consisting of ±13.09 gross acres (±570,200 SF), per survey on file. 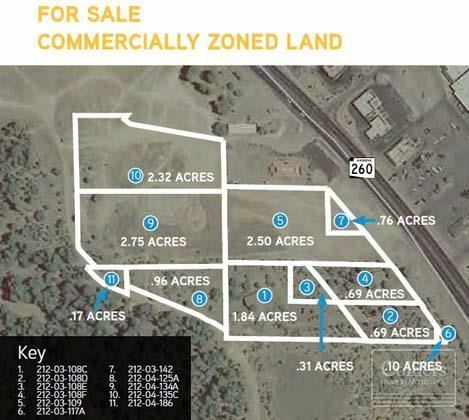 Land is located at 4450-4470 S. White Mountain Road in Show Low, Arizona. Zoning is C-2, general commercial, according to the city of Show Low website. Asking price is $2.85 million ($217,723 per acre or $5 PSF). The eastern frontage of the property is located on South White Mountain Road. The southern boundary is across from the entrance to the Vacation Village Arena, which is south of the Park Pineway shopping center. The northern most boundary is just north of the Park Pineway Road, with the western boundary fronting Cub Lake Road.